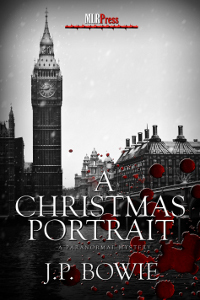 When Peter and Jeff accept an invitation from their longtime friends Rod and 'A' to spend Christmas in London, they don't expect murder and mayhem to be part of the festivities! A Christmas pantomime a British tradition, when families flock to the theatre for ribald entertainment, gender bending roles and thinly veiled innuendo. But jealousy, hate, murder? Surely that's not part of the entertainment? Or so Peter and Jeff think when they accept an invitation to spend Christmas in London from their longtime friends Rod and 'A' (short for Arthur). 'A' is making his return to the stage in Cinderella, playing one of the ugly sisters. Things get really ugly when Ken Blackwell, the other sister, tries to shake up Arthur's self-esteem by calling him a washed up old has-been, then goes on a rampage when the show's director falls ill and Rod is asked to replace him. Peter's psychic intuition helps him see past the pantomime's gaudy glitter and into the dark secrets some people are desperate to conceal.